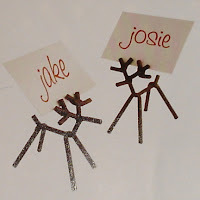 As well, I am making gift tags this year. 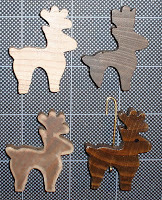 Each one will have a tiny wooden reindeer (can you see that reindeers are my favorite theme?) attached that can be used next year to decorate the recipient's tree. 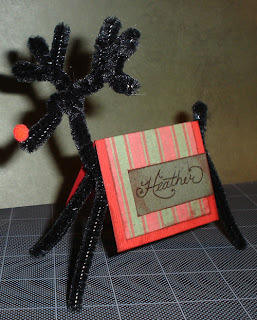 I bought the "raw" wooden reindeer at our scrapbooking store. Hubby drilled holes in them for their hangers, and I stained, sanded and varnished each one (each step shown below). 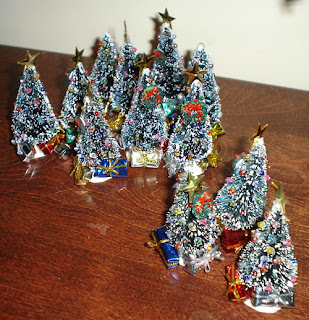 Lots of fun to do, especially while watching some seasonal movie favorites! 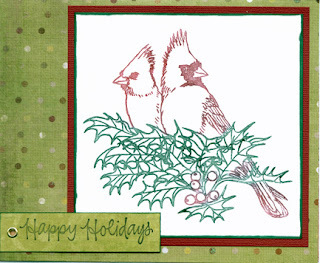 This year, I made two styles of Christmas cards. One version is for friends and family, the second, a specific design especially for my Star Wars buddies. Here's a card I just thought up and made yesterday. 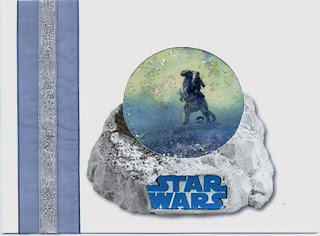 I did a Star Wars "snowglobe" using two sheets of plastic page protectors sandwiching some fake snow inside...they can be really shaken up! I hope everyone enjoys them as much as I did making them!